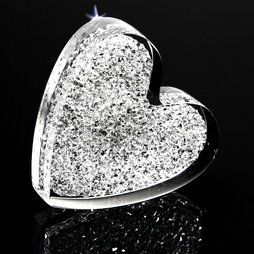 The heart made of sparkling Swarovski diamonds is not just a classy eye-catcher, it also holds paper love notes. Contrary to Diamond Heart this magnet is heart-shaped and not square. The pretty thing is made of 1200 Swarovski elements that were cast in acrylic glass based on a worldwide unique technique. A strong neodymium magnet lends this classy item its adhesive force of 450 g.